Offering you a complete choice of products which include fiberglass tissue. We are offering a wide range of Fiberglass Tissue. 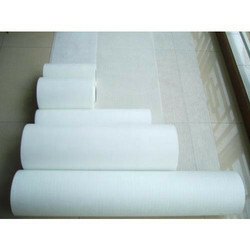 It is a non woven felt made of randomly oriented glass fibers distributed in a special binder by a wet-lay process. This material is used in composite surface applications. It adds smoothness, luster, and cleanliness of color to the surface and it improves water resistance and durability of the product. Serves as a wrap for both underground and overground pipeline systems to counter natural and artificial corrosion. Good for waterproofing applications and waterproofing in the form of a roofing felt. Ideal for reinforcement of flooring and roof materials. Serves as both a reinforcement and protection system. Compatible with bitumen and coal tar enamels. Superior strength characteristics due to longitudinal reinforcement with glass yarn.